Many people were shocked today at the breaking story and undercover video which showed the lies which rogue pregnancy agencies in Ireland have been telling women. Unfortunately we at the Abortion Rights Campaign were not shocked. 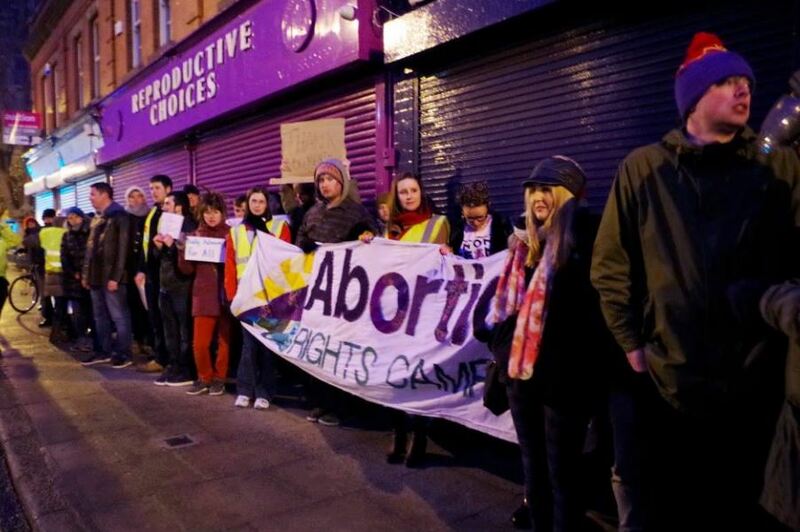 We have picketed these clinics before, most recently in February 2014 with a range of other Pro-choice groups, including Choice Ireland, Irish Feminist Network, and Re(al) Productive Health. In March of this year, we exposed how this clinic pays for Google Ads to push its site into the top results for the search term “abortion in Ireland”. This leads many to contact their services, believing them to offer impartial advice and help. The website presents the agency as being impartial and pro-choice, when in fact it appears to be owned & operated by a member of an anti-choice organisation. We also have heard the lies told to the undercover reporter in the video before, as they have been used in similar rogue clinics in the UK and the USA. The Abortion Rights Campaign works to dispel the myths around abortion. One myth mentioned in the article is that abortion increases a person’s risk of breast cancer. This is false. There is zero connection between having an abortion and an increased risk of breast cancer. There is, however, a connection between breastfeeding and lowering the risk of breast cancer. Those people who say that abortion increases the risk of breast cancer are assuming a) that a person who continues a pregnancy will breastfeed, b) a person who has an abortion doesn’t already have children and hasn’t already breastfed. A pregnancy which is ended at any stage, be it due to an abortion, a miscarriage or giving birth does not cause cancer or an increased risk of cancer. In the video it was stated that if someone is 8 weeks pregnant, it was too late to use abortion pills. This is not the case. The abortion pills are used in the UK for up to 10 weeks. The ‘counsellor’ in the video also made inaccurate and scaremongering statements about possible complications from having surgical abortion. In fact, abortion is 14 times safer than giving birth. The vast majority of abortions happen before 12 weeks and there is no risk of cutting the bowel as was mentioned in the video – there are no scalpels involved. Dr Peter Boylan stated on Newstalk this morning that the risks involved with having an abortion are no different from having a miscarriage. Finally, the ‘counsellor’ made horrendous allegations about what an abortion may do to a person’s mental health. Post-abortion stress is a made up syndrome, has no medical grounding and has been debunked several times. In countries where abortion is accessible and normalised there is no evidence that it causes mental health stresses in women. However, restricting women’s access to abortion can provoke feelings of depression and anxiety and does increase the risk of suicide in pregnancy. This can be exacerbated by the isolation and stigmatisation felt by those compelled to travel overseas for access to safe, legal abortion services. If you want to know more about the Abortion Rights Campiagn’s work busting the myths which surround abortion, or if there is any other information you’d like to know, we suggest having a look at the facts section of our website: https://secretweb1337tbh.abortionrightscampaign.ie/facts/ and www.bpas.ie.